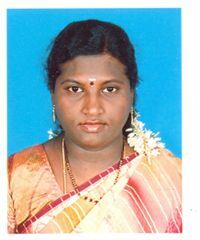 Mrs.P.Pandia vadivu did her B.Sc Zoology at M.V.M Govt. Arts college for Women -Dindigul, M.Sc Applied Biology & M.Phil Futurology at Gandhigram Deemed University - Gandhigram, M.Ed Education Technology at Madurai Kamaraj University-Madurai, M.Sc Psychology at University of Madras –Chennai, M.Sc Guidence and Counselling & Ph.D (Synapsis Submited) at Mother Teresa Women’s University – Kodaikanal. Her areas of specializations are ‘Metacognition’ and ‘Concept mapping’. She is awarded the fellowship by Mother Teresa Women’s University and UGC and PG diploma in Intel Teach to the Future. She has passed the NET examination in Education (2003). She has experience of 6 years Lecturing in B.Ed colleges -The Institute Of Advanced Study In Education as a Guest Lecturer, Psychology & Biology Faculty in Our Lady college of education . She has Two years University experience in Mother Teresa Women’s University-Chennai as Guest Lecturer - handled the subjects are Bioinformatics and Life Science to MCA students in computer department and 5 years teaching Experience in Higher Secondary Schools in Chennai and Dindigul. She has to her credit, presented more than 25 papers in various Regional/national/international seminars and conferences. Published 10 papers in proceedings, participated more than 10 in Symposium, workshops and conference in Regional/national/international level . Conducted a Workshop in Mother Teresa Women’s University-Chennai. Mrs.P.Pandia Vadivu is a District and University Champion in CHESS. Five years teaching experience in School level from 1996 to 2001. Eight years research experience -2003 onwards. This page was last modified on 28 August 2010, at 21:21.